Automakers snap up aluminum; body-in-white coming to N.A. Novelis Inc. and Alcoa Inc. have announced plans to ramp up production of aluminum. Shown is Alcoa's plant in Davenport, Iowa. 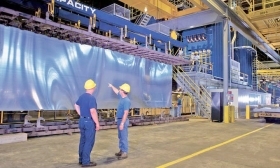 In an interview, Alcoa Marketing Director Randall Scheps predicted that aluminum sheet consumption would triple by 2015, and that the auto industry's growing appetite for aluminum sheet could cause shortages next year. A pound of raw aluminum ranges from 90 cents to $1, roughly twice the cost of mild steel. Boron steel -- a high-strength steel sometimes used in roof pillars -- can cost 70 to 80 cents per pound. Says Alcoa's Schep: "Every carmaker in the United States is actively looking at an all-aluminum body-in-white."